I've been a happy member of the CRT camp for many, many years now (as have most of us) and after finally convincing myself I needed an LCD I started to shop around - this was 3 months ago. You see, after being surrounded by expensive toys for the last few years - no thanks to my credit card - I'd become accustomed to the quality items; yet whilst still being a full-time student I certainly am anything but frivolous with my money. Coming from one of the larger and bulkier of the CRT's, a beloved Philips 201P, i had high expectations to whatever would be basking me in light for the next few thousand hours of work and geekdom. 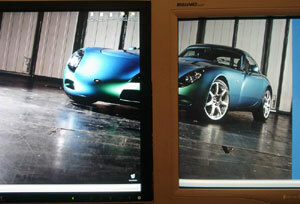 So my search started in the sensible end of the spectrum with the 20" widescreen LCD's. After looking around i realised that it would be more of a side step, or even a downgrade moving from my 21" CRT, and so my search went bigger. Next step up was the 24" widescreen LCD's and there certainly was a forboding price hike to go along with this supposed luxury - but wow was it worth it. I also glimpsed a couple of 30" widescreen LCD's which were absolutely jaw dropping, but when realising I'd have to spend another $400 on a second graphics card to run it properly my brain and my wallet agreed - No. After missing out on the most recent Bulk Buy for the Dell 2405FPW i turned my interest to the Dell 2407FPW, even with all the bad press that had surrounded its rather lackluster release. Well i'm here to say that if there were problems... there aren't any more. 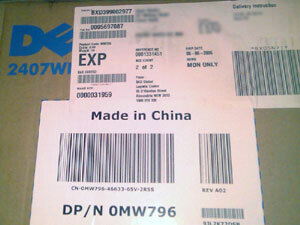 After a few little hiccups involving shipping logistics and tracking (or lack of), i received two boxes from Dell. The first and least important was a small box with a power cable in it, while the second and most important was the 2407FPW box. Whilst the delivery guy was still standing there I had a quick glance at the revision model to be pleasantly surprised by an A02! For those wanting a bit of history on the model, the A00 was plagued with banding and text shadow, whilst the A01 saw marked improvements there were still issues. I think the delivery guy thought I was crazy when I actually got more excited by the revision number on the label, than at the size of the box. After taking delivery I shuffled it down the hallway and into the study, then carefully opened it up to be greeted by some very well-packed goodies. 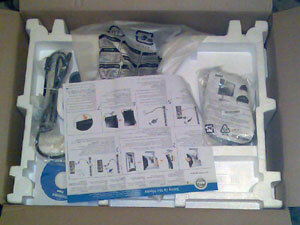 The standard contents include the 2407FPW itself, the stand, a USB cable, DVI cable, analogue video cable, an installation cd, and a few bits of paper. I promptly got it set up and the first thing I checked for as soon as I'd gathered my thoughts was the text blurring, of which i'm proud to report there is NONE. After taking this photo I went and enabled the Microsoft True-Type image smoothing as personally I find it easier to read. 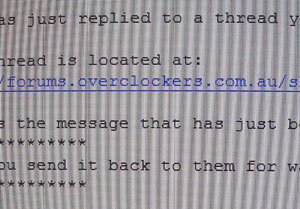 Some people love it, others hate it... but coming from a CRT this made the leap a little less daunting. Next up was the gradient test. Now as most of the readers will know the 2407FPW has been plagued by banding in its Rev A00 and in some A01's, but i'm proud to say that Dell have hit the nail on the head in the case of this fine specimen of an A02 - as long as you keep it in 'Desktop' colour management mode. 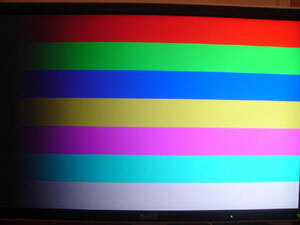 You see, they've implemented some new fandangled colour/image trickery which resulted in some rather abhorrent banding. After a quick run through the nVidia colour calibration setup I loaded up my new widescreen backdrop - a warehouse-style picture of one of TVR's most beautiful creatures, the T350. I've spanned it across one side of the 2407 and one side of the 201P just for a bit of a comparison. 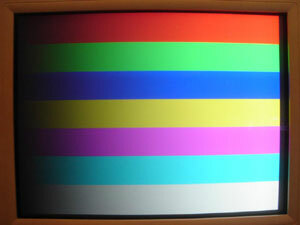 I think this pretty clearly displays the difficulty I had in setting up the 2407 for accurate colour; in order to get the colour response I was after I had to up the brightness to 22 within the monitor controls. I'm still experimenting as to what works for me, but i've left it at this setting for the moment. Here's a side by side shot of my 201P with the new 2407, just so you can see the size difference. 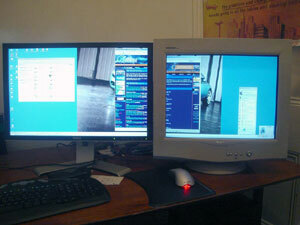 If you can learn to love the LCD image quality, then you'll certainly appreciate the extra desktop.